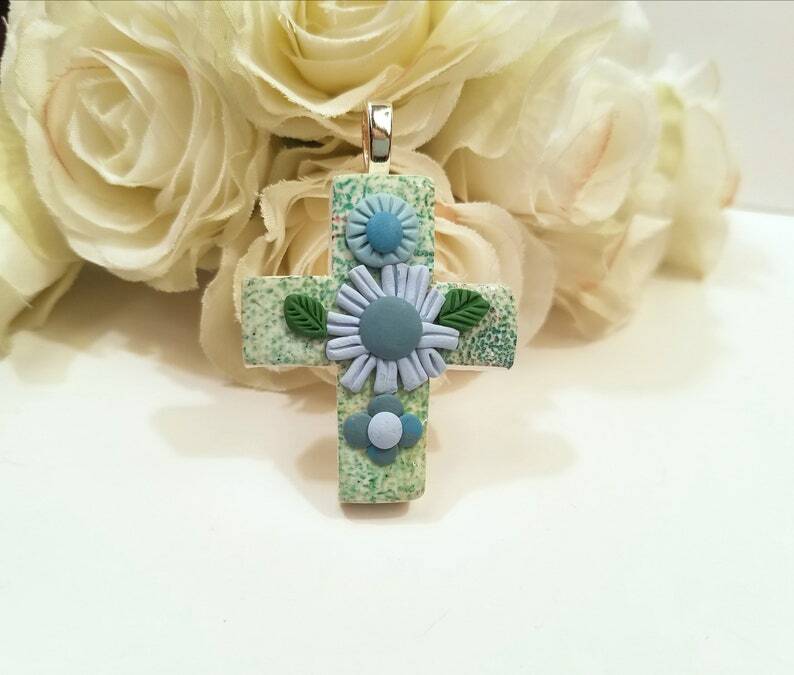 A one-of-a-kind cross pendant (optional necklace) handmade of white polymer clay, colored with ink, with 3 flowers handsculpted of clay in shades of blue with green leaves. Measures approximately 1 1/2 inches wide x 2 1/8 inches tall including a large aanraku silver-plated bail to hold a chain, cord or ribbon. Wear as jewelry, hang as a decoration! If you'd like a RIBBON FOR HANGING (no extra charge), write in the MESSAGE TO SELLER box at time of purchase. This symbol of faith makes a lovely gift for Easter, Confirmation, Baptism, Christmas, birthday or any special day.